Everyone has secrets. Are yours holding you back? How are you leveraging them for a better life? 188 backers pledged $18,125 to help bring this project to life. Visit my personal website, www.krisloewen.com, or www.hiddenbook.net to get in touch with me or stay up to date with this project and others. But we don't always know what to do with them. My new book, "Hidden," explores how secrets hold us back from becoming the people we were created to be. It also explains how to leverage them for receiving life's greatest gifts. "Hidden" builds a framework for understanding where to put the things we hide, when to expose them, and how to use them to make the world a better place. Secrets are filled with potential energy. A single burning match holds the power to destroy an entire forest. That same energy can also be directed to warm a home or sustain life. Self-concealment is the same. The things we hide can tear us apart, but also bring us together. Brene' Brown struck a chord with many Americans in her popular TED talk on shame and vulnerability. Frank Warren's magnificent, lifesaving project, PostSecret, is now in the Smithsonian. An underlying reason for this resonance is our collective intuition telling us that what we conceal holds the keys to our futures. "Hidden" makes a compelling, heartfelt, and Biblically informed case for the value of carefully stewarding what we keep in shadow. "Hidden" is more than just a sterile exploration of the topic. Rather, it is an intensely personal memoir of how I've come to make sense of my own secrets and brokenness, while finding healing on the other side. I am incredibly excited to share my hard work with my friends, family, church community, and the world. I envision this book becoming a curriculum base for small groups, discussion fodder for book clubs, a resource for preachers preparing sermons, a textbook for religion and social science instructors, and a personal devotional for individual pilgrims on the path to spiritual maturity. Even though the book is written from the perspective of a Christian leader, it is generous in its approach and widely applicable for pilgrims on many spiritual paths. I have crafted the book in my spare time over the past three years and the 85,000 word manuscript is now ready for the next steps before hitting the market: professional editing, layout, and distribution. My original thesis has evolved and refined over this time, and I can't be more expectant now for the positive impact it will have on its readers. Your Kickstarter pledge will ensure this timely and essential message gets to those who need it most, maximizing its potential impact. We all have secrets. "Hidden" shows us how to put them to work. I grew up in Southeast Washington State amid a tight-knit community of loyal families and dedicated Christians. My home church (where I now have the joy of pastoring) is on the campus of Walla Walla University, a small Christian liberal arts college that is part of the Seventh-day Adventist denomination. This rich environment proved to be a God-send for me as I navigated a number of challenges growing up. Secret-keeping became my modus operandi for coping with life in the wake of traumas like my brother’s untimely childhood death, the fallout of my parents’ divorces, and my father's addiction. Unfortunately, self-concealment also became an anchor holding me back from maturity. As an adolescent, struggling through several layers of compulsive behavior, I came to personally identify with the heavy toll self-concealment imposes on spiritual growth. Today, as an adult and a pastor, I've continued to witness similar struggles in the lives of those I've served. To suggest that secrecy has become a continually-emerging theme in my life and ministry would be an immense understatement. Over a decade now into my vocation of pastoral ministry, I continue the hard work of dealing with the secrets of my past and present, confessing when appropriate, and protecting them when necessary. As a father of two little boys, I am committed to altering certain unexpressed (and therefore secret) systemic family cycles we inherited. As the husband to my best friend, confidant, and number one cheerleader, I work to leverage my secrets to deepen intimacy and trust in our relationship. As a man, I understand my life's underlying mission as creating and advocating for inclusion in the world; a state where every person feels welcome and wanted at the table. One of the most powerful ways I've learned to do this is by helping people experience the power of hearing, "me too," in response to vulnerability. A close friend once quipped that secrets are the theme of my life. In a way, I think he was right. And I believe the same might be true for all of us. Every author knows the process of writing anything is longer and more complex than the finished product might appear on the surface. Crafting a manuscript as ambitious as "Hidden" is a huge achievement in itself. But this is just among the first steps in publishing. The "Hidden" manuscript is now ready for professional developmental editing, copy-editing, graphic design layout, and a professional distribution plan. So far, my personal investment in the project has been primarily in the form of time, and secondarily in the form of checks written to fund book-cover design and Kickstarter video production. The next steps require monetary investment at a level that is beyond my means as a full-time pastor living a simple lifestyle. Cover design by Adam Newbold, click to see more of his work. Kickstarter is a perfect platform for launching a book project such as "Hidden" because of it's broad audience, ease of access, and potential for viral communication. My hopes for this successfully-funded-campaign are threefold: (1st) Finish developing the book into a truly excellent, tight, and dynamic resource; print and distribute paperback and eBook formats. (2nd) Pursue self-publishing via one of the many available reputable lightning-press and digital platforms. Demonstrate the book's marketability to traditional publishing houses for a possible reprint in the future. (3rd) Set the stage for the next book I write, and the next, and the next! "Hidden" is just the first installment in a number of ideas I have lying in wait. Economic and technological influences have caused traditional publishers to contract in their willingness to take on first-time authors. At the same time, accessible platforms for self-publishing are increasingly appealing to writers of all experience levels. With the initial capital invested in this project, I will be able to share "Hidden" confidently with with the world and send it directly to market via CreateSpace, a publishing platformed designed for independent self-publishing authors. The $17,613 Kickstarter goal is the bare minimum needed to get "Hidden" off the ground and onto the shelves, while also fulfilling anticipated Kickstarter rewards and fees. Kickstarter campaigns are "All or Nothing." This means that if we raise $5,000, $10,000, or even $15,000, no backers will be charged for their pledges, the project will receive no funding, and it will not move forward as planned. If this campaign raises more than this minimum goal, I will add additional stretch-goal rewards as outlined below. If this project raises $25,000 or more, I will develop Hidden into an audio book version in addition to the paperback and eBook editions promised in the original campaign. The audio book will be distributed and available for purchase through all the typical channels (iTunes, Audible, etc). All backers who pledge a minimum of $25 as a part of the Kickstarter the campaign will receive an MP3 copy of the book via email at that time. Backers will receive this bonus reward along with whatever other rewards are associated with their original pledge. If the campaign reaches $35,000 or more pledged, I will go back with my design team and create an exclusive, deluxe, hardbound-with-dustcover-edition of the book. This product will include additional appendices, the discussion guide, an extra chapter, and more resources not included in the paperback edition. All backers who pledge at least $100 for any reward level will receive this special-edition volume in addition to the audio book and the rewards associated with their original pledge. Finally, if the campaign crosses the $50,000 threshold, in addition to the rewards associated with the previous two stretch goals, I will also design, plan, and launch a "Hidden" gathering. This event will continue the conversation on the power of secret-keeping in our lives, and strategize how we can live with more authenticity and care. The "Hidden" gathering will feature speakers you know and love, including but not limited to yours truly. This event will be available for free to all backers who pledged at least $225 toward the original campaign (and for an additional fee to other backers.) Details regarding timing, location, and logistics will be announced at a later time. Will be delivered via email after the Kickstarter campaign closes, following editing, layout, and final submission for production. This digital file will be delivered via email before the official release date of the paperback or Kindle editions of the book. Format will be .PDF or .epub. Pre-release eBooks will be emailed to backers after the Kickstarter campaign closes, after editorial and layout is complete, but before the book is released to the public through major retailers and distributors. We will also keep you up to date with the production process moving forward. Estimated time of delivery for the digital is April or May of 2018. 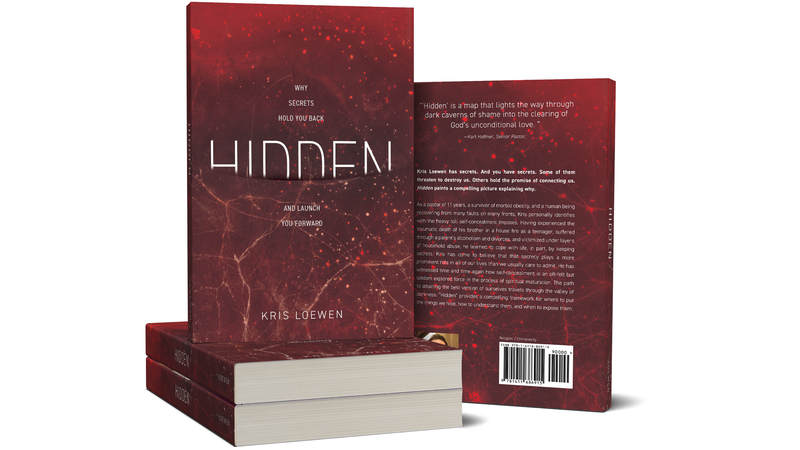 Limited-edition signed paperbacks of "Hidden" will be mailed to backers before the book goes on sale at major retailers but not until editing and layout are complete. This early delivery is is an extra perk I am extending to the first 100 backers of the project. All other backers who select the regular paperback reward, two-pack reward, T-shirt pack, or small group packs, should expect to receive their rewards very close to the official public release date of the book (TBD). The private webinar/interview to take place at a mutually agreed upon time on a mutually agreed upon platform (Skype, phone, Zoom, FaceTime, etc). Interview may also take place in person in the Walla Walla area if backers prefer it. This reward includes one single session that may last up to 2 hours (as needed). Webinar must be scheduled, and take place, within 12 months of the successful completion of the Kickstarter project. After the Kickstarter campaign closes, backers to be rewarded T-shirts must specify (via Kickstarter survey) preferred sizing, gender, (and thereby) color. The mockups below are not the final design layout, but do largely represent the look I intend. During the campaign, I encourage backers to offer feedback on ideas for the look of the shirts in the comments section. I am also open to other suggestions for clothing options. My friends tell me I know my way around the kitchen - as well as the backyard barbecue. My family and I also live in Walla Walla, Wash., a little town in Southeast Washington state that has become known for its eateries, wineries, and a sleepy Americana style of life. The backers who take me up on the the private dinner reward will not be disappointed by the experience, I promise. Backers who pledge to receive the private dinner may invite up to seven guests to attend the gathering, and are responsible for any travel or lodging costs to get to or stay in Walla Walla. Of course, local Walla Wallans wanting to support the "Hidden" project are also more than welcome to join in on this great party. All food, entertainment, drinks, conversation, and other special surprises are included in the $984 pledge. All you need to do is get to the Loewen house! We'll take care of the rest! This event will be arranged around a mutually agreed-upon date and time. Books included in the private dinner reward can be supplied in person at the event, or shipped ahead of time. Event must be scheduled, and take place, within 12 months of the successful completion of the Kickstarter project. Check out our friends' video on the culture of Walla Walla here. This was produced by the same group that put together my Kickstarter campaign video: the CM Bell Company, cmbell.com. Examples of my public speaking are widely available on the internet. A good first source for accessing samples is my personal website: http://www.krisloewen.com/#/speaking/. Below is a relatively current sermon I gave on the theme of doubt. This talk is actually an adapted version of the chapter in "Hidden" on the theme of despair. For additional samples or options on material, please inquire directly with me. Backers who are looking for a weekend or one-day speaking engagement with me can browse available online presentations for solid examples of the flavor this reward will take. Additional ideas and options are available upon request, just reach out! Backers who will welcome me to speak at their organization or event can expect to give input on the topics/themes to be addressed. These details will be sorted out at the same time scheduling is done. This reward includes ONE single speaking event that may include one or MANY lectures (as needed). The event may not exceed 3 days. Details, subjects covered, and specific needs will be determined in consultation with each backer. "Hidden" content is highly adaptable to almost any setting, and Kris is eager to share. Backers at this level will also receive a case of paperback books (quantity of 30) and matching discussion guides (quantity of 30). Additional books can be made available at the event for purchase. Travel and lodging for Kris is not included in this backing level; backers are responsible for making arrangements and covering any of these costs. Event must be scheduled within 12 months of the close of this Kickstarter campaign. Wildfire is a weekend retreat originally designed for boys in college or senior year of high school. Wildfire is an initiation into mature Christian masculinity – one that takes place among a diverse circle of men from the community (with as close to a 1:1 ratio of staff to attendees as possible). The format is experiential learning oriented around hearing God’s voice rather than informational seminar style education. The focus is on discovery of one’s God-given callings in life and the barriers that keep us from that. It is an intensely personal, deeply spiritual, and consistently transformational for those who have the courage to attend. This is not a lecture series, it is not a seminar, it is not a typical retreat. It is highly experiential, Biblically informed, decentralized, and community-powered. The retreat is designed as a 3 day experience that can take place in many settings (wilderness, camps, retreats, hotels, etc.). Wildfire was created to help especially young men to get clear on their personal sense of mission, identify the things that get in the way of that (often secrets), and build community and support with other men who will help them achieve it. The context has ranged from wilderness rafting, to camping, to camp/retreat settings; but because a broad swath of ages in leadership is key, we have found the retreat center to be the most desirable. Wildfire grew out of a recognition that our culture has lost ‘rites of passage’ for adolescents moving into adulthood. Thus, boys grow into “men” but continue living by the “boy code” which shapes popular American masculinity: sexual conquest, aggression, bullying, arrogance, isolationism, addiction, and even passivity or complacency. Boys need the community of men to “set the edge” of expectation for masculinity for them, see the man in them, and bless them into the challenge and responsibility of adulthood. Wildfire defines masculinity based on the best qualities typified in the powerful Godly men written of in the scriptures; namely Jesus. Wildfire suggests that what sets men apart from boys is knowing their purpose as creatures made in God’s image. Without a doubt, Wildfire has more capacity to jar and catalyze change in young men than any program I’ve been a part of. Because it’s a weekend event, it can’t be a magic bullet – but it consistently proves to become an Ebenezer for guys in their spiritual journeys. The robust and thorough curriculum is not personality driven - meaning that any dedicated team of adults can be trained to put the weekend on. Backers at this level will receive training for a team of up to 20 on how to facilitate wildfire, permanent access to all the exclusive materials needed for Wildfire, and Kris' presence Thursday-through-Sunday for facilitating the event with your organization. There are so many details that go into planning such an event, that they cannot all be listed. But backers at this level can guarantee that after going through the experience, local teams of leaders will be able to carry on with Wildfire experience with their own teams and in their own organizations for years to come. Included with this reward is a case of 30 "Hidden" books. As with other in-person events described above in other rewards, travel and lodging for Kris is not included in the pledge amount, backers agree to cover these expenses as a part of their pledge. A mutually agreed upon time/date for the event must be settled upon within 12 months of the closing of this Kickstarter campaign. Distance/skype coaching sessions will be an absolutely essential part of the process before the weekend event itself takes place. Feel free to contact me as well for additional information. "Hidden" will be my first published book. The process of putting it together has been filled with joy, as well as with opportunities for growth. Because I'm a husband and father first, and a pastor of a local congregation second, writing has been a third or fourth-tier priority. But this work and this message is firmly entrenched in my heart. I've stuck with it through three-plus years of labor, and I absolutely will see it through. There is little-to-no risk to backers of not receiving the finished book and other specified rewards. If this is funded, "Hidden" will come to market; and the first copies will be delivered to my backers. Period. For backers earning rewards that require setting specific dates, there is a small risk that perfect scheduling will not be achievable. While I do guarantee fulfilling all speaking appointments, trainings, and or dinner parties, backers may have to compromise on "perfect timing" in exchange for "good-enough." Depending on the scope of the community that develops in support of "Hidden," production of rewards may prove to be a challenge. I am a one-man operation at this point. If a few hundred people back the project, I'm confident I'll be able to fulfill all orders myself. If a few thousand people join the cause, I'll have to hire staff to keep the project moving forward. In short, delays are a possible risk. The same goes for communication. I'm easily accessible right now via Kickstarter and my website. If support is broad, I may employ intermediaries to help with communication. Because there is no book like "Hidden" in the genre of nonfiction Christian Spirituality (or really in any genre), I'm hopeful that there will be wide interest in it. Because of my personal experience with secret-keeping, I have a particular passion for the subject. I am not, however, so narcissistic to imagine that I am the only person qualified to undertake such a project. This cause is bigger than me and an individual and I'm looking to partner with, not compete against, other practitioners and voices for good mental/spiritual health along the way. Most of all, thank you once again for your generosity, enthusiasm, and support! By pledging any amount, you will bring "Hidden" one step closer to reality. Whether $1 or $1,000, every dollar helps. I can't tell you how much it means to me that you'd support my work! Support the project AND get the eBook version of "Hidden" before it goes on sale at Amazon, B&N, iTunes, etc. If you don't know what an eBook is, the next reward level is for you! Signed Paperback, eBook, + more! ONE Signed-by-the-author paperback edition of "Hidden," an emailed copy of the eBook, and your name included in the book's acknowledgements. All this before it's available to the public. For the first 100 backers only! ONE paperback copy of "Hidden," and an emailed copy of the eBook. Receive ONE, "I Have Secrets," T-shirt from a limited-edition run along with ONE copy of "Hidden" in paperback, personally signed by the author. One for you, Two for your friends! Spread the love! You get THREE copies of the paperback - one for you and two to give away! I'll even send you a card template to print as a stand-in at Christmas time if you'd like to give these as gifts! Backers at this level will also receive the early eBook release described above. Receive TWO, "I Have Secrets," T-shirts from the limited-edition run along with TWO copies of "Hidden" in paperback. You'll also receive the early eBook release described above. Instant material for your next small group curriculum or book club. This reward includes EIGHT copies of the paperback edition of "Hidden," EIGHT copies of the eBook, along with a chapter-by-chapter shareable PDF discussion guides. Jump in to the spirit of secrets with this very limited reward. Think of this as the brown paper "grab bag" from the candy store when you were growing up (but without the disappointment). We are keeping the details about this reward strictly hidden - but we guarantee backers at this level, (a) won't be disappointed, and (b) will get more than they would've in tangible goods and fun otherwise by choosing a lower-tier option. I'll even send you a card template to print as a stand-in at Christmas time if you'd like to give this secret reward as a Christmas gift! EIGHT copies of the paperback plus an exclusive webinar (or live interview in Walla Walla) with Kris. This reward also includes the aforementioned discussion guide and eBook edition. Free shipping within the USA. $20 shipping to Mexico and Canada. $30 shipping internationally. See details in campaign description. Private Dinner with Chef Kris & Friends! Join Pastor Kris and his family in small-town Walla Walla for a private party. You and your seven guests can count on a hand-made meal by Kris (vegan, vegetarian, omnivorous, paleo, even gluten-free, just let us know! ), great conversation, new friends, and a beautiful low-key evening together near Pioneer Park. This family friendly reward will also include the "small-group 8-pack" reward described above. See additional details in the reward description in the main campaign page. Schedule Kris to come speak for your church, organization, business, classroom, school, family, summit, or other group. Depending on the needs of individual backers, this reward can consist of a single lecture or up to an entire 3-day weekend seminar with multiple presentations. Included with this reward is a case of 30 "Hidden" paperback books. Kris' travel and lodging in fulfilling this reward is not included in the pledge amount. Backers at this level agree to pay for and make these travel arrangements once dates are set. Event must be scheduled within 12 months of kickstarter close. Please see additional details about this reward, read in the rewards section of the kickstarter campaign description. Learn how to host and facilitate "Wildfire," a coming of age weekend retreat Kris has developed (and discuses at some length in the book). Backers at this reward level will receive all training and materials to take his or her organization through the experience for years into the future. Included with this reward is also a case of 30 "Hidden" books.